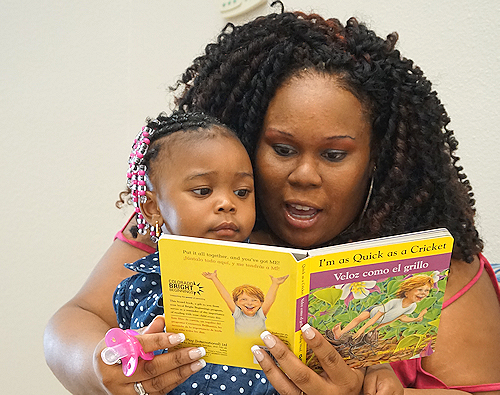 The Early Learning Coalition of Sarasota County has a number of activities to support early literacy. Parents receive a variety of resources. Training and support is offered to early care and education providers. Books are distributed directly to children throughout the year at their early care sites, at community events and through our Literacy Buddy volunteer program. Our new Bucket of Books program offers businesses the opportunity to have books for young children to enjoy while their families are at the business. Early Language and literacy (reading and writing) development begins in first 3 years of life, from infancy. This is the critical time for brain development overall. It is a continuous developmental process. Early literacy skills develop in a context of social activities and positive interactions in real life settings utilizing strategies and materials to promote the development of important skills. It is a natural unfolding of skills in a context of literacy rich experiences, exposure to new things and new words, and what they mean. These early language and literacy skills are closely linked to child’s earliest experiences with books, stories, language, talking. Children gain significant knowledge of language, reading and writing long before they enter kindergarten. Exposure to books and reading to your child as well as exploring, playing with books, singing, babbling, nursery rhymes, listening to stories, hearing and recognizing words, and scribbling are the building blocks for language and literacy skill development. Click here for a flyer with other information on early literacy. Click here for a Talk, Listen, Read flyer with tips and strategies for promoting early literacy skills. If you are interested in being a Literacy Buddy, please visit the Literacy Buddy page of our site. If you are a local business interested in our Bucket of Books program, please visit this section of our site.